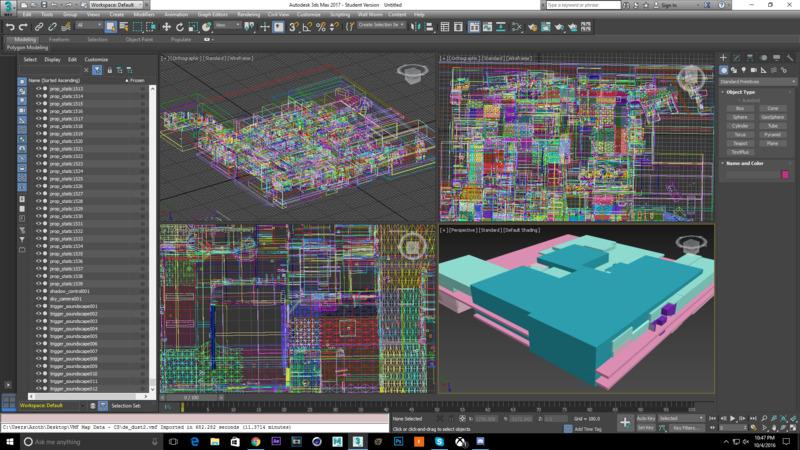 Hello, I recently downloaded WallWorm and was trying to import de_dust2 into 3dsmax for an animation. After importing the .VMF file with WallWorm I got this result. Any help with this would be greatly appreciated! In the current builds of WW, you have to follow all the instructions for extracting VPK data etc. Doing all that can be a hassle. All that is changing soon with native VPK and native MDL loaders. 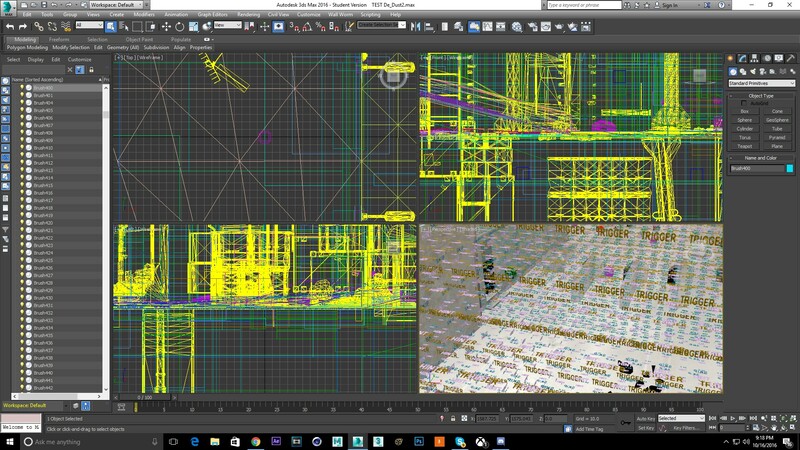 But at the moment, it's only in the WW Pro Beta for 3ds Max 2016. So if you want to import with all the assets and materials now without hassle, you'll have to get WW Pro and download the BETA in the store. Otherwise, it will be available for standard WW in some other versions of Max in the near future. But it may still be several days to weeks for it to be in free WW. You can follow the state of the next update here. Hey, just got WW pro and having an issue installing. I am at the part of the installation where I go to global settings and press "Activate Wall Worm Pro" from inside 3dsmax. It takes me to the wall worm pro web page even though I have the two required .dll's in the assemblies folder. Any advice on what to do? Also, about to switch to 3dsmax 2016. Will report if that fixes the installation issue. Thanks for buying WW Pro. To properly install WW Pro, you need to make sure to read the WW Pro readme that includes installation instructions. Primarily, that you need to unblock the download ZIP file before extracting. This is because WW Pro contains DLL files, and Windows automatically puts them in a restricted state if they were downloaded from the Internet. You have to give Windows permission to use them as needed. Also, I have updated your account on the forums to have access to the premium section which includes a few topics related to WW Pro. Note that to utilize the new MDL tools in Max 2016, you need to make sure to download the BETA download and not the regular download. Both are available in your account. Every time you download WW Pro to install or update you need to remember the unblock instructions. Again, those are in the README. Thank you for the quick help on installing, got it all worked out, I got my WW Pro Beta properly installed into 3ds2016 now. Another question, (Sorry for being total n00b) how do I go about using native VPK and native MDL loaders to import maps with textures / objects. And can I find VPK or MDL files within the CS:GO files I got on my computer, which are just the ones I got by default after buying CS:GO through Steam? Or do I use something like Nem's Tools to extract and get VPK or MDL files? Sorry, this is all new stuff that we are actively developing for Black Mesa... and I haven't documented it yet. With your version, if you import a VMF, it should pull the files from the actual game files natively. You may need to update your matGen path to a writable folder as WW will extract VTF files from the game files (VPK) into that path automatically. After that, jump import a vmf. I will add more info soon. Hey, thanks for the help so far. I don't know why but I can't seem to figure these things out. When I import something now I get a bunch of random lines (skip, trigger, hint). Is there I way I can get rid of those things? Also, if what I mentioned above isn't something that's an easy fix, do you do any commission work? Because, if so I'd pay $100 USD (PayPal) for a dust_2 obj file with textures. Simply because I really got to get started on this animation and I just had something come up recently that got me working on that for about a week so getting started on this animation is a big priority to me right now. Random note: When I get the animation done I'll be putting WW in the ending credits. This is a great plugin. Thanks again.